What is Really Simple Systems CRM? Really Simple Systems CRM is a full suite sales, marketing and customer support online CRM platform that is easy to use and works immediately. The hosted CRM system is scalable to hundreds of users. With this app, you can access your data from anywhere by simply connecting to the Internet. This CRM app enables you team to manage all your prospects, customers, tasks, contacts, marketing campaigns and sales opportunities in one system. You get full functionality as the vendor runs the CRM system on their servers. You need not install or maintain anything on your computers. The vendor maintains the software and servers, and backs up the data every night. All you need is a browser to use Really Simple Systems CRM. A simple to use online CRM with email marketing built-in and free support. Really Simple Systems CRM has been designed specifically for small and medium-sized organizations, or departments of larger companies. This Cloud CRM software needs no specialist knowledge and staff can be trained in minutes. The integrated email marketing module means you can build marketing campaigns and send emails and newsletters directly from your CRM system. There’s no need for a separate email service provider and everything you need is in one place. The vendor believes the key to successful CRM implementation has very little to do with technology but everything to do with getting people to use the system properly. To help customers, the vendor offers free support and helps you load your data and get started. This CRM system is priced so that customers can add additional features as their businesses grow. The Free plan is ideal for startups and users can then scale up as needed with three flexible pricing plans, Starter, Professional and Enterprise. What Problems Will Really Simple Systems CRM Solve? Too often CRM systems fail due to poor user adoption – the systems are too difficult to set up and complicated to use. 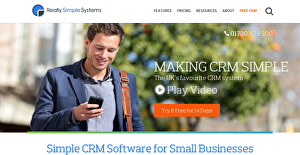 Really Simple Systems has designed its CRM to be simple to set up and easy to use. Staff can be trained to use the system in a matter of minutes and will be able to directly see the benefits. For customer relationship management to really be really effective, businesses need to create consistent marketing that uses the insight gained through the CRM system. With the Really Simple Systems integrated email marketing module you can set up marketing campaigns and send emails and newsletters directly from the CRM. This means all your data is in one place and you can drill down to individual level, personalizing emails and setting up drip marketing campaigns. Even so, some organizations may need help in getting started and loading their data. The vendor offers free customer support to make sure customers are using the system properly, and also provides training videos and webinars to get them started. It's essential to realize that hardly any app in the CRM Software category is going to be an ideal solution that can meet all the needs of different business types, sizes and industries. It may be a good idea to read a few Really Simple Systems CRM reviews first as certain services can perform well only in a really narrow set of applications or be created with a very specific industry in mind. Others might function with an idea of being easy and intuitive and therefore lack advanced functions needed by more experienced users. There are also services that cater to a wide group of users and give you a complex feature base, but this frequently comes at a more significant cost of such a service. Make sure you're aware of your needs so that you pick a solution that offers all the functionalities you search for. How Much Does Really Simple Systems CRM Cost? We realize that when you make a decision to buy CRM Software it’s important not only to see how experts evaluate it in their reviews, but also to find out if the real people and companies that buy it are actually satisfied with the product. That’s why we’ve created our behavior-based Customer Satisfaction Algorithm™ that gathers customer reviews, comments and Really Simple Systems CRM reviews across a wide range of social media sites. The data is then presented in an easy to digest form showing how many people had positive and negative experience with Really Simple Systems CRM. With that information at hand you should be equipped to make an informed buying decision that you won’t regret. What are Really Simple Systems CRM pricing details? What integrations are available for Really Simple Systems CRM? * The Marketing module or Service module is included free with 5 or more users on the Enterprise plan. Or you can get both modules for free with 10 or more users. Pros: The Really Simple Systems CRM is SO easy to use, really user-friendly and effiecent. For a small Company to use this to record cutomer details its such a great tool. It's very simple to use and would be easy for people of all ages to get to grips with quickly. People who've joined my company pick it up very fast. The Really Simple Systems CRM is SO easy to use, really user-friendly and effiecent. For a small Company to use this to record cutomer details its such a great tool. Simplicity of use is excellent. I've used a number of CRM tools over the last 20 years and RSS is the one that I consistently recommend for small businesses. Thanks for your review of Really Simple Systems! Do email us on ask@reallysimplesystems.com so we can link this with your account. Easy to use and understand with simple and effective custom options. It is very simple to use and enable easy tracking of prospects and customers to assist marketing and sales efforts, it is very easy to use and does exactly what I need. Thank you for your review. I'm sure our support team will be able to help you with your export data requirements and reporting. Do get in touch on support@reallysimplesystems.com and let us know what you need. If you need different options for "source" etc. you can customise these to meet your requirements. Please see our Support Hub page https://support.reallysimplesystems.com/look-up-tables/ for Custom Dropdown Lists. If you need more information about Really Simple Systems CRM or you simply have a question let us know what you need and we’ll forward your request directly to the vendor.